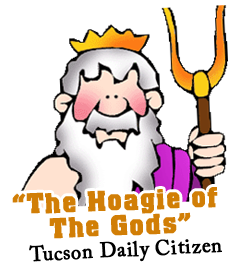 All sandwiches come on a white hoagie roll baked daily by Viro’s Real Italian Bakery, a local baker. Most sandwiches are garnished with onions, provolone cheese, lettuce, tomatoes, pepperoncini, spices (salt, pepper, oregano) and oil. We also have other items that you can put on sandwiches. Feel free to add some pickles, jalapenos, mushrooms, bell peppers, black olives, mayo, mustard, ranch, vinegar or parmesan. 6" 9" 12" 18" 36"
Feel free to add some extra condiments to any sandwich. We have Mayo, Mustard, Ketchup, Ranch, Vinegar, Pickles, Jalapenos, Parmesan, Red Pepper, Mushrooms, Bell Pepper, Black Olives. Served inside of Pita Bread. Grilled Ribeye Steak, Grilled Onions, Provolone Cheese, Lettuce, Tomatoes, Pepperoncini, Spices & Oil. Served inside of Pita Bread. Lean Ground Beef, Grilled Onions, Provolone Cheese, Lettuce, Tomatoes, Pepperoncini, Spices & Oil. Any Sandwich Can Be Built Inside Pita Bread If You Like. Try One Of Our Sides With Your Hogie. We Carry Boulder Chips In Plain, Hickory Barbecue, Jalapeno Cheddar, Malt Vinegar, Salt & Cracked Pepper. We Carry Kalil Products. RC, Diet RC, Dr. Pepper, Squirt, Pink Lemonade, Hires Root Beer. We Also Make Fresh Daily Non-Sweetened Tea.